It sound almost as a joke but: since I have watched the latest 3D movie from Pixar I couldn’t get it out of my brain. One reason is Wall•E himself with his antics and his behavior, and the other reason is the quality of the script. When you think about it, it sounds absolutely logical: how can you sell a character to the audience when it is a comedy and the character doesn’t talk? Right: you make him/she as cute as possible. And Pixar delivered on that one – that’s for sure. This dusty boxy robot with his robotic noises can melt anyone’s heart in an instant. But they were even able to create one of the cutest romantic movies of all time. 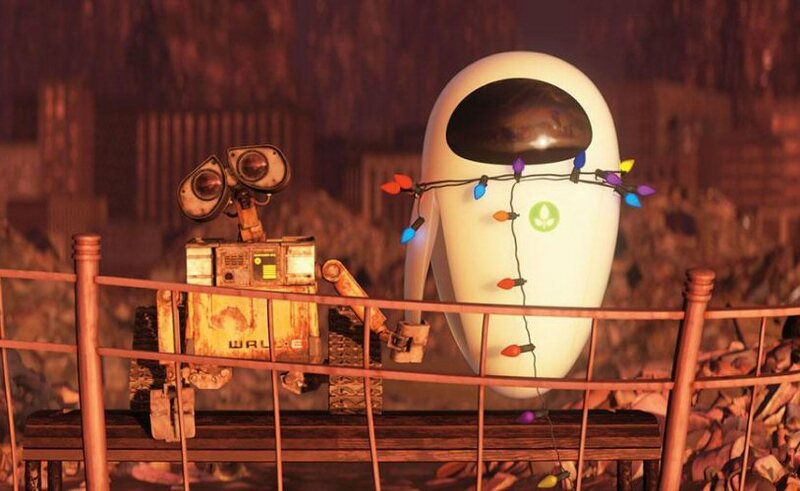 The moment when WALl•E and EVE finally “talk” to each other with only two names and perhaps four words is so damn cute I could almost scream for not being able to write this scene for myself. Let alone come up with the idea of a scene like that one. And don’t forget the idea to come up with robots that are, well, robots. You remember ROBOTS? You know. The one with two legged robots talking like humans? 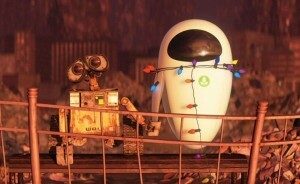 *shiver*Pixar treated them like robots and used this constraint as a chance to make them even cuter. But cuteness alone isn’t enough to deliver. Although my brain is too sucked up to come up with a title I am sure there are many movies that tried and failed with just that: cuteness. So there has to be more – which means a great and well written story. Looking closer at the beginning alone shows you their genius at drafting stories. In a good movie script the writer first shows us the world of the character and the life of the character before the actual story starts. This helps to establish the setting and everything else. The same takes place in WALL•E. The first 13 minutes show us the daily life of the main character, doing his job. I think most of us would have started the movie by letting WALL•E wake up, hence we might have told everything from morning to evening. 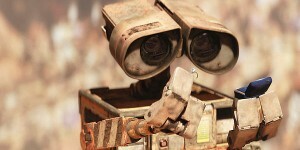 But for this movie the writers start the telling just shortly before WALL•E goes home. And they were damn right with their decision because showing somebody work the whole day (even someone as cute as WALL•E) is boring. But there is another big and important reason for this decision: the plant. The plant is anything and everything that drives most parts of the movie. Therefore it is logical to introduce it right before the end of the first act. Just watch the movie again and you will see that EVE makes her entrance literally seconds of screen time after WALL•E finds the plant. Of course this is to be expected because anything else that would have taken place after this story beat would have dragged the story. It would have been irrelevant and perhaps confusing (“is it about the plant?”, “is something else important?” etc. pp.). As a result there was no way to add anything related to explanatory scenes and introductions after this moment. Therefore, it had to take place beforehand. As I already stated, showing someone work for twelve minutes is boring, because most of the time WALL•E simply compresses waste. Hence they used the perfect way to bring us closer to him: when he is at home, after work, showing us his collection of old stuff and his wises and dreams. Of course, they also used this as a chance to show us the world he lives in, by letting him drive home through the garbage, the other WALL•E’s and the advertising. So, we get all to know that is important: that BnL (Buy ‘n Large) was the only company in the world, that humanity literally wasted earth, that the humans fled, and that they let the WALL•E’s do the clean up. And of course, they introduce us to the Axiom, which will play an important role later in the story. Since this introduction was necessary to let us settle into this world, it was also important to show us him working for at least one time. Firstly, we had to see that he is the one, creating those towers of garbage (meaning: a lot of time has passed) and secondly, he had to find the plant during work (come on – a plant just right before his door? Yeah. Sure…). In the end this means that they had to write one full cycle of 24 hours because it would have been bad to let him find the plant just after four or five minutes of screen time. Since the plant is the core of all actions later on, they would have had to introduce EVE just right after that scene (hence shortening his introduction) – or would have shown us the “WALL•E and his collection”-scene. But that would have dragged the story and mixed up the introduction and the “action” parts of it. It’s amazing how well written these twelve minutes of WALL•E are, don’t you agree?